Dancers should have one year of previous tap experience. This class will take dancers’ knowledge of basic tap steps (shuffles, flaps) and incorporate new tap vocabulary, as well as musicality, rhythm, and upper body connection. 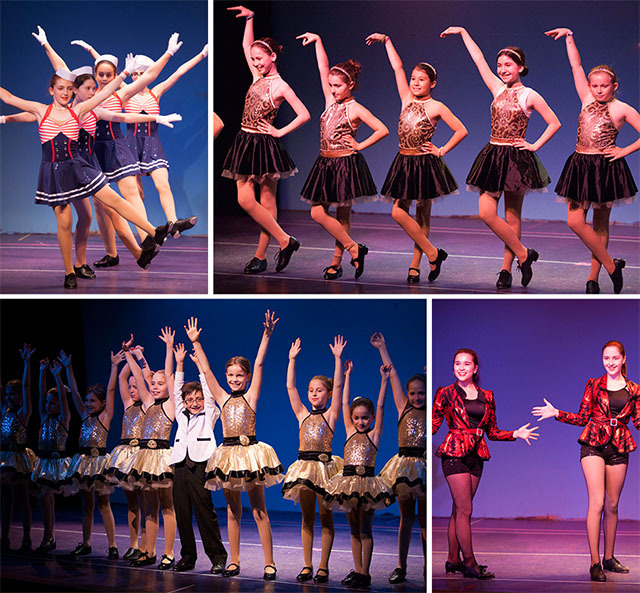 For dancers continuing their tap training, rhythm and musicality are built on through more in depth tap technique. Students with a minimum of 4-5 years tap training will delve further into rhythm and musicality in this class. They will practice tone, style, upper body, and faster tempos using across the floor exercises and improvisation. Choreography will enhance students’ ability to pick up steps quickly and accurately, and be able to apply material to music with different rhythmic styles and tempos. Students in this class have minimum 5-6 years training, and have mastered all basic tap technique, including knowledge of the Shim-Sham, all time steps, tap turns, and a basic knowledge of improvisation. Students in this class will continue to hone their musicality with complex rhythmic variations. They will study different kinds of music as it applies to their tapping, from Duke Ellington and Ella Fitzgerald to iconic and contemporary musical theater tap pieces. This class is for teens with three years minimum experience. Students will be challenged each week with a new combination in varying rhythmic styles, which they’ll have to pick up quickly and execute in small groups. They’ll continue to work on basic technique and rhythm exercises across the floor using different types of music. This is a class for advanced teens who are looking to perfect upper body, showmanship, and other more advanced elements of tap. Students should have knowledge of all basic tap vocabulary and be ready to take it to the next level with improvisation, study of historical tap pieces, and performances. Come tap with one of the leading tap teachers in New York City. Pam is a guest teacher at Steps on Broadway in NYC where she teaches adult tap. She dances with the leading tap companies in the city and will teach you a fun filled, rhythmic tap class where you will learn basic tap technique and fun tap combinations to contemporary music. If you like tap at all, you will love this class!